Invite participants to a discussion on aging and ageism. Introduce Be Bold, Claim Old with the video, blog post, and/or Claim Tag poster. Facilitate a discussion on aging and ageism, raising awareness around age biases. 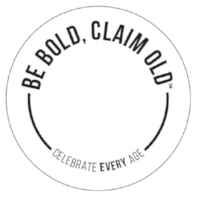 Distribute Claim Tags stickers for participants to proudly share their age. Give out Celebrate Your Age signs for participants to complete - photos are fun! Consider creating an interactive and intergenerational art project to share what each person enjoys about their age. End on a positive view of aging, as eloquently shared in the video below. Interested in bringing Be Bold, Claim Old to your community? Please use the contact form or click here to learn how to access materials and join the movement. Together we can make old as valuable, significant and meaningful as young! In addition, Amy is available to introduce BE BOLD, CLAIM OLD and lead discussions for boards, staff and residents in select communities. Contact her today. A great place to start is the 2-minute Be Bold, Claim Old video that outlines our bold vision. Read FIGHTING AGEISM by Amy Gorely, a guest post on Changing Aging with Dr. Bill Thomas, that delves into ageism as a social justice issue. "Be bold, claim old. When I mention this phrase in my campaign to fight ageism, I am often greeted with nervous laughter, an inquisitive look or a resounding YES! "It's meant to be provocative. It's meant to be a powerful call to action. . ."
Instead of a name tag, how about a Claim Tag? Write how old you are on a Claim Tag sticker and proclaim your age proudly. Wearing a Claim Tag like the one below is a great way to invite others to celebrate all ages. Use the poster below to spread your message and encourage others to wear a Claim Tag. For access to the files to print your own Claim Tags stickers and poster, contact us. Ask participants to write their name, age and one thing they celebrate about their age on a "Celebrating Aging" sign. Share amongst the group. Photos or a selfie-booth are fun ways to showcase what different people at different ages appreciate about growing older. To get your own "Celebrate Your Age" sign, contact us. 1. The"In Praise of Wrinkles" poem is a wonderful way to end the discussion on a positive and inspiring note! 2. A deeper dive into the ideas behind Be Bold, Claim Old is available through the following interview on Dr. Bill Thomas' the Age of Disruption tour webinar. An amazing clearing house for all things anti-ageism, including videos, speakers, and other resources. Old School. Check out the excellent resources listed on This Chair Rocks website! The first item is a free guide to starting a consciousness-raising group around age bias, and it also links to a thought-provoking TED-talk and a wealth of other resources. Ashton Applewhite’s book, This Chair Rocks: A Manifesto Against Ageism is a must-read! Leading Age, whose vision is An America freed from ageism, has a thorough list of resources to help support your discussions around ageism.